Lillian Blanche Hughes was born on April 23, 1891 in Iowa, the daughter of Charles Wesley Hughes (1856-1935) and Clarissa (Clara) Francis Schofield (1870-1934). Her parents later homesteaded in Savannah Twp, Becker County, Minnesota. Lillian was the granddaughter of another one of my elusive relatives – George Arthur Russell Hughes. In 1912, Lillian and her young son traveled to South Dakota, eventually landing in Burke County, North Dakota. To date, I do not know what brought her to the Dakotas; she did not have direct family that lived there. 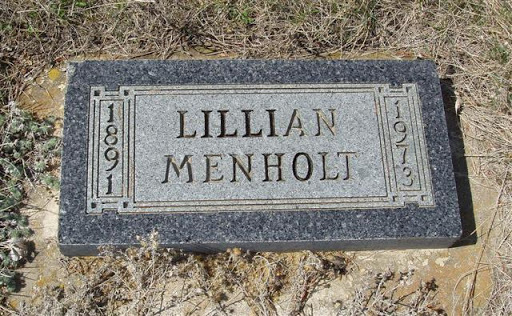 In 1913, Lillian married Peter Hansen Menholt (1876-1959), an immigrant from Hjørring, Denmark. They homesteaded in Burke County, North Dakota had 5 children. Grandma Menholt was alive when I was born. I do have small memories of her – I remember she liked to play cards and had a boisterous laugh. I still hear that laugh – her daughter (my grandmother) had it, my mom has it, and so do I. Laughter is a great thing to pass down the family line, don’t you think? very interesting. I'm jealous about all the tidbits you are finding about your family. I hope once things settle down, i can really starting looking for my relatives. What a lovely heritage to have a laugh passed down from generations. 🙂 It's great that you know so much about your relatives.